I don't think I've written a movie review before. Anywhere. Ever. In fact, now would probably be a good time to confess that I'm not the biggest movie fan. I rarely feel like there's enough time to connect with the characters and so prefer TV series and novels. But this movie is an exception on so many levels, and I really want to help spread the word. Not only did I quickly connect with these characters and want to join them for the ride, I enjoyed every minute of it. This movie touched me deeply. I cried throughout. It moved me, and it made me think. With the possible exception of the big Hollywood movies like The Blind Side and The Chronicles of Narnia, I've never seen such a fine Christian film. The cinematography was stunning. The acting was great. And the story was powerful. Add in an awesome sound track by some of my favorite bands, and I was one satisfied customer. About a year ago, a friend of mine, Cecil Stokes, told me that he was going to be a producer for a movie that would tell the story of an abortion survivor. This is not really mentioned in the previews, but I think that detail is one that Christians will want to know about. For the daring subject matter alone, this movie is worth seeing. When the heroine is undergoing unexplained physical and psychological symptoms, her parents are forced to finally admit to her that she was adopted after surviving a failed abortion. Along with her hunky co-star, she takes off on a journey of discovery to try to make sense of her life. The intense issue is dealt with in a sensitive matter without falling into preaching or didacticism. Which is pretty amazing. The message is carried through the emotion of the actors more so than through any indicting speech against abortion. 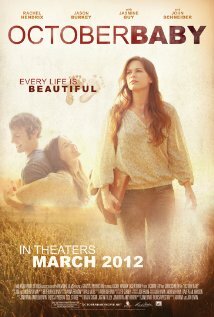 In addition to the pro-life emphasis, the movie also portrays a lovely story of healing, forgiveness and hope. A subplot of the movie addresses control, which is an important issue I find often overlooked in Christian circles where "submission" of children, wives, and parishoners is often stressed without any balancing teaching on the dangers of a controlling and domineering leader. To me everything about this movie was just lovely and perfect. Surprisingly (or maybe not), it didn't fare well with some of the big national reviewers, and so I would like to address this as well. While everyone said the cinematography, lead actress, and supporting actress Jasmine Guy were amazing, and even admitted that the movie avoided being preachy, it seemed that overall these reviewers didn't "get it." The primary complaint was that the script wasn't strong and fell apart in the middle. I disagree. And so do the millions of Christians who put it in the top ten during it's first week in the box office. The reviewers said there were too many "coincidences." But of course, they don't understand that in the lives of praying believers such "coincidences," also known as miracles, are normal, even expected. God at work in the lives of man is reality to us. In this story, God didn't just fix everything, the heroine had her own tough decisions to face, but God did guide her along her path to the people and information she needed. Another complaint was that the comic characters on the road trip were unneccessary. I would say unneccessary or not, they were funny and endearing and brought an extra sparkle to the film. Many Christian movies are too issue driven and on the nose. I felt the road trip scenes gave a great coming of age feel to this story, which were very believable in the life of a homeschooled Christian girl. In fact, I loved the way Christians were portrayed in the movie in general. Broken, flawed, and utterly human, yet filled with a hope in something greater than themselves. This film has an awesome ending, that will not only leave you encouraged and satisfied, but sighing as well. And when you go see it (and you need to) be sure to stick around for the closing credits. You will get an "extra" that you won't soon forget in the form of an amazingly touching testimony by one of the actresses. After watching this movie I remembered that I've cried my way through pretty much every well-made Christian film that I've seen. Because they have something secular reviewers don't understand. The anointing of the Holy Spirit. In closing, I also mentioned that this movie made me think, which I wouldn't have guessed possible since it concerns a subject I've already given a tremendous amount of thought to. The part that struck me, though, was when the director shares in the closing credits that they wanted to be sensetive and bring healing to the "post-abortive mother." Those are strong words. Again, without being preachy, those simple words reminded me that an abortion does not stop you from being a mother. It only changes whether you are the mother to someone who is dead or alive. A big congratulations to Cecil and everyone involved in this movie for bringing God's beauty to the earth and advancing His kingdom through this powerful film. Have you seen October Baby? What thoughts and feelings did it leave you with? What Christian films have touched you the most and why? What Christian films have not worked for you and why? Wonderful review Dina. I think this one is best for me to watch at home, alone. I hope it touches someone who needs forgiveness and healing and salvation. Many someones. I haven't seen this either, but I'd like to. I'm usually an at home movie girl too. I took some excedrin to make sure I'd make it through the loud theater experience without a headache. I wanted to put my movie dollars into this project, though. I plan to buy the DVD when it's released as well. Wow. Dina, thank you for sharing this. I'd heard the title, but had no idea what it was about. Nor did I realize the big reviewers didn't care for it. I will definitely watch it. For the record, I seldom agree with movie reviewers. If they love it, I usually don't. If they pan it, I usually love it. So there. I'm different from everyone else and I avoid the wildly popular shoved-down-your-throat movies, while embracing the ones they don't care for as much. Of course there are exceptions like The King's Speech and The Blindside. But as an example: Bridesmaids. Critics loved it. I hated it. Or I should say, I hated the first three minutes, because I turned it off. Something Borrowed. Poor reviews. I loved it. I really think most people would enjoy this movie. It might be hard for someone who has had an abortion, but it's very gentle and made with restoration for those women in mind. I haven't seen it, but I'd like to. I read about it and have heard some of the criticism aimed toward it. Thanks for the review, Dina. Great job. Thanks, Susie. And I just talked to the producer, Cecil Stokes on the phone. He loved the review. Whew! I'll have to keep a lookout for this one. Thanks for the thoughtful review, Dina. whoa. subject matter hits close to home. i'm an adoptee who found her birth mom. she told me at one point in her pregnancy with me, her mother wanted her to get an abortion (to "cover up" the family shame of unwed mother). besides abortion still being illegal at the time, my birth mom was "no way!" on even wanting that. she said i was too precious to her even though she knew she would be giving me up for adoption. will have to check the movie out. will also pass on the recommendation to others as well. thanks for bringing this film to my attention. i hadn't seen or heard anything about it as of yet. Dina, I haven't seen the movie or was aware of it. So thank you very much for bringing it to my attention. I'm on the lookout for it now. I have no idea if it released in Canada at all, but if not I'm sure it will be on DVD in a few months. This subject matter is something that I relate to because of certain circustances. As most movies which cover this are not well recieved this one really sounds promising. Then again, there will always be people who will hate movies like this but for ideologocal reasons rather than any weakness in the movie itself. If anyone knows when this is out on DVD i would be interested to know. That's a good idea, Anna. I'll come leave a comment when the DVD is released.